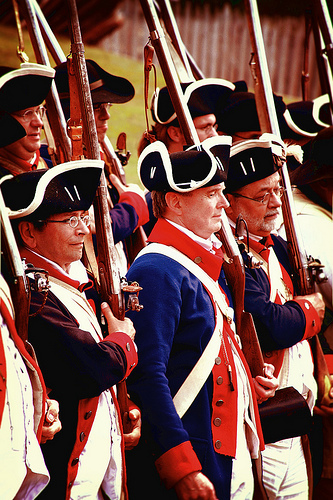 Loyalists, or Tories, were residents of the colonies who supported the British during the American Revolution. Popular imagery has created the Loyalist stereotype as the local rogue-the drunkard, the miser, the wild man in the woods, the robber, or the sly trader in any line of work. Although some North Carolina Loyalists might be classed as rogues, most belonged to segments of society that would be expected to remain attached to the British government, including merchants whose businesses were seated in Scottish trading centers, English officeholders serving their time in colonial administration (and on the side making property investments in America for their extended families), and immigrants recently arrived from various parts of Europe (but largely from the British Isles). Others declared their allegiances as a result of personal rivalries and experiences or issues faced in their immediate setting. North Carolina's Loyalists were as varied in their interests, occupations, origins, education, ambitions, and expectations for the future as those who believed in and fought for American independence. Most of them had a deep love for North Carolina and the social ties that they enjoyed there, and they were undoubtedly troubled by the divide between them and many of their fellow citizens. However, they were willing to fight for a principle. Loyalist Jonas Bedford, who was born in 1735 in Elizabethtown but later lived in the western part of the colony, expressed the sentiment of many Loyalists in his response to a Patriot officer urging him to sign an oath: "I have been Sworn as an Officer and Magistrate under my lawful Sovereign. I never will turn my back to my King's cause and perjure myself. I shall remain a loyal Honest Subject during my life and to my King and Country." For five years Bedford lived quietly and unmolested-until the British arrived in the neighborhood in 1781. It was then that his insecure neighbors burned his house. He was forced to flee, leaving his wife and eight children behind. Loyalists who could afford to do so often left the colony. Many officeholders who owed their position to the royal government simply packed their possessions and went into exile. Large numbers of Highland Scots who had been in North Carolina for a generation or less moved to Nova Scotia or Florida, neither of which was involved in the American Revolution. Some historians have argued that there was a higher proportion of Loyalists among North Carolina residents than in any other colony, but this appears to be false. North Carolina's proportion seems to have been greater than that of Pennsylvania and Connecticut, but the colony seems to have lagged behind New York's and Georgia's Loyalist population. The excellent port facilities at New York Harbor, New York City's concentration of wealth, and the fact that it offered refuge to Loyalists from elsewhere may explain its large number. Georgia, as the youngest English colony in America, was not as completely weaned from the mother country as the older colonies had been. "Inspection: A few of the colonial loyalists stand ready for inspection." Uploaded from Flickr user Ken Schultz. Available from http://www.flickr.com/photos/schultzlabs/2791857338/ (accessed May 14, 2012).